The Ducks and the Beavers are each undergoing an era of rebuilding. Both programs had to start over several times in the past decade and should now be experiencing some stability. But which program is truly set up for the long haul? Former defensive coordinator Brady Hoke’s historically bad defense led to a horrible 2016 season. The 2016 season was an unmitigated disaster for the Oregon Ducks Football team. A 4-8 record capped by a humiliating loss to the inferior Beavers in Corvallis was the last nail in the coffin for Mark Helfrich. Helfrich tried to sell the athletic department on a decent, young offense and a few players who looked like potential difference makers on defense. Accompanying his request for another year at the helm were two years of the worst defense in school history and a recruiting class so barren that even the most optimistic of fans couldn’t help but worry. The athletic department fired Helfrich in the days following the loss to the Beavers and the rest of the coaching staff followed him out the door. The Ducks eventually settled on Willie Taggart. 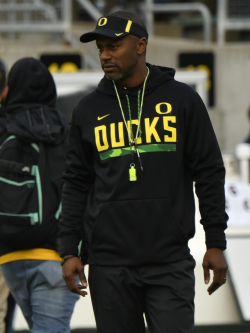 Using his seemingly endless enthusiasm and charisma, Taggart salvaged a top-20 recruiting class and the Ducks quickly felt stable again. 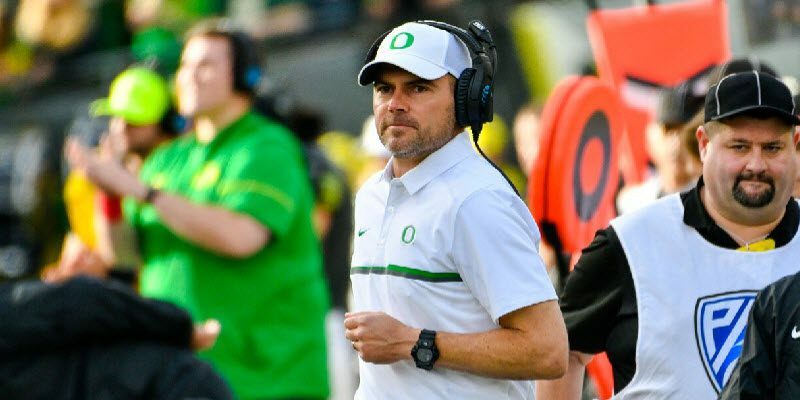 Helfrich was an incredible offensive mind — he was never held under 20 points as an offensive coordinator or head coach — but was equally inept at putting together a defense. He also never embraced modern recruiting, and the fanbase didn’t connect with his quiet demeanor, which was what ultimately made him so easy to fire. Willie Taggart revived a dead Oregon program. Taggart was the polar opposite. He connected with the fans and recruits, and was outgoing, bordering on fun as an interviewee. He got a defensive coordinator that immediately made the Ducks defense viable, something that hadn’t been true in years. But he looked helpless at times on offense. Taggart also changed the recruiting culture in Eugene. The old staff would be lucky to have 10 commitments at the start of November, while Taggart had to worry about having enough roster spots to accommodate his group of highly touted recruits. 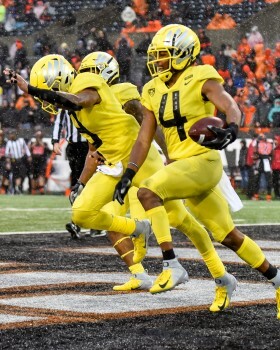 He started his first game in Eugene with a kick return for a touchdown (the Ducks’ only one of the 2017 season) and ended it with the most lopsided victory in Civil War history, beating the Beavers 69-10. We now know that the 2017 Civil War was the last game Taggart would coach for the Ducks, but at the time, the fanbase couldn’t be happier. In a single year the coaching staff and a few defensive stars had seemingly alleviated most of the Ducks’ problems from 2016. Can Mario Cristobal field a more efficient offense? 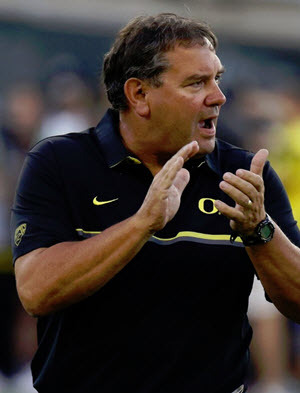 After Taggart unceremoniously abandoned the Ducks, they decided to turn to their offensive line coach to keep the team together. Mario Cristobal brings many of the same characteristics to Eugene as Taggart. He is very charismatic, a great recruiter, has a losing record as a head coach and came with a Florida background. As the 2018 season wore on, more similarities to Taggart became apparent. He was unsure about how to use a premier quarterback talent, he lacked focus on offense, and the defense, while not a liability, wasn’t elite. The 2019 recruiting class is going to be the best in school history, at least on paper. Ask any SEC school and you’ll hear about how recruiting is the lifeblood of a program. Ask USC and you’ll hear how much more important having an innovative coach is. 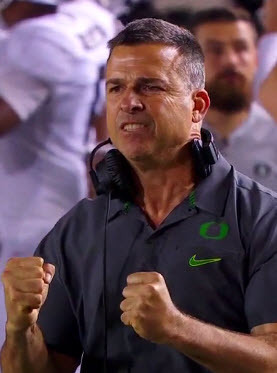 Can Cristobal become an elite in-game coach to match his abilities as a recruiter? At only 48 years old he has plenty of time to become a more efficient coach on both sides of the ball. He isn’t calling plays, meaning he recognizes that he isn’t an elite play-caller at this time. This should increase his chances of success with the right offensive coordinator. He already got better as a game manager after the failure to seal a win against Stanford, showing an ability to adjust and improve his craft. It wouldn’t be a stretch to think that Cristobal can put it together as a head coach and bring in another era of excellence for the Ducks. The Rodgers brothers were two of the most exciting players to ever take the field for the Beavers, and Mike Riley is their winningest coach of all time. Their failure to replace the on-field ability of those two players and inability to bring in a coach that can rival Riley has sent the team in to a perpetual rebuild since 2012. Can the Beavers overcome the Ducks’ talent advantage? Gary Anderson’s tenure was nothing short of a disaster, with his overall record sitting at 7-23. His premier win was the 2016 Civil war, a game he had hoped would springboard his team to real conference contention. But it did no more than buy him another offseason as a head coach. Jonathan Smith’s first season showed how bereft of talent the Beavers’ roster truly was, with a record of 2-10. The former Washington offensive coordinator had no combination of players that could make a stop on defense. His system on offense clearly works, but he barely has any talent to execute with. That said, Smith is a very competent coach. Where the last two Ducks’ coaches have struggled to find an offensive identity, Smith always knows what he wants to be doing. But, his roster is awful. His recruiting does not inspire confidence, with his unquestioned headliner being ranked lower than 18 Oregon signees. His activeness on the transfer market is filling a lot of immediate needs on defense, but for any real contention Smith needs to up his recruiting game. Is that possible in Corvallis? Smith’s coaching ability will eventually push the Beavers toward contention. They will have everything to play for and nothing to lose, but right now they resemble Colorado after it entered the conference. Which rebuild is further along currently? Oregon, and there’s really no question about it. But which rebuild will last? That depends on whether Cristobal can become more than a great recruiter.